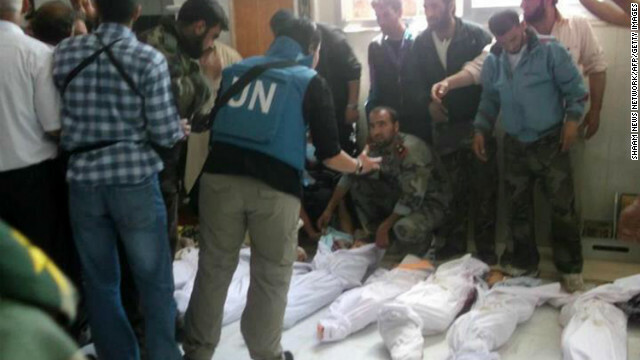 U.N. observers visit a morgue in Houla on Saturday before the burial of massacre victims. Houla Massacre: Tipping point, but in what direction? The horrific footage of executed children lined up in a neat row in Houla prompted an immediate outcry from diplomats around the world. The U.N.’s representative to Syria led the call. “We are at a tipping point. The Syrian people do not want the future to be one of bloodshed and division,” special envoy Kofi Annan said earlier this week. Soon, others adopted the tipping point theme as they expelled senior Syrian diplomats from their countries. The gut wrenching images seemed to be moving the international community toward intervening in the nearly 15-month conflict. But was it really a tipping point or just one well publicized atrocity no different than many others that have taken place this past year in Syria? Nonetheless, powerful images do possess the ability to push the international community into action, even if the pictures don’t represent a significant worsening in a violent conflict. CNN’s Christiane Amanpour recalls how the broadcasting of disturbing scenes in Bosnia prompted world leaders to take decisive steps that ended the violence. “In 1995, when a terrible massacre took place in Srebrenica, when thousands of Muslim men and boys were executed based purely on their ethnicity, and this was a genocide, this was the worst crime of such magnitude in Europe since World War II,” she said. Two weeks later the fighting was more or less over and peace negotiations began. After seeing images of the massacre in Houla, Amanpour said it would be unusual not to call for some sort of intervention. “We’ve been there before. We’ve been there in Bosnia. We’ve been there in Rwanda. We’ve been there for the last several decades. And this kind of depravity, frankly - gross violation of international humanitarian law - demands under the law a response,” she said. So far, that response has been largely diplomatic. Philip Gourevitch has written about the conflict for New Yorker magazine. While everyone seems to be calling the recent massacre a tipping point, he doesn’t believe it will lead to a military intervention. “I don’t see any scenario whereby that’s desirable, credible or likely to happen at this moment,” she said. Gourevitch believes there’s a danger in allowing emotions to be a driving force behind policy toward Syria. “These images, these appeals to conscience, these tremendous shocks to our system and to our idea of what we would like the world to be like, they’re pictures of symptoms,” he said. Gourevitch thinks those symptoms can’t be addressed without some sort of idea of what the political solution would be. So far, no viable one seems to be taking hold. “Even the most strenuous voices advocating some kind of armed, forceful intervention to stop the killing, none of them can propose what they’d like to see on the other side of Assad,” he said. While diplomats continue to talk about this being a tipping point in the crisis in Syria, there’s the possibility that it will continue on without any intervention for some time. A prolonged conflict increases the possibility of more Houla-like massacres in the future. Russia has the show, when it all goes to hell and turns into a civil war and regional conflict, we'll all know who's policy did it. Russia.